This best-seller uses the sugars already in the leaves to speed up growth and improve flavour and aroma. 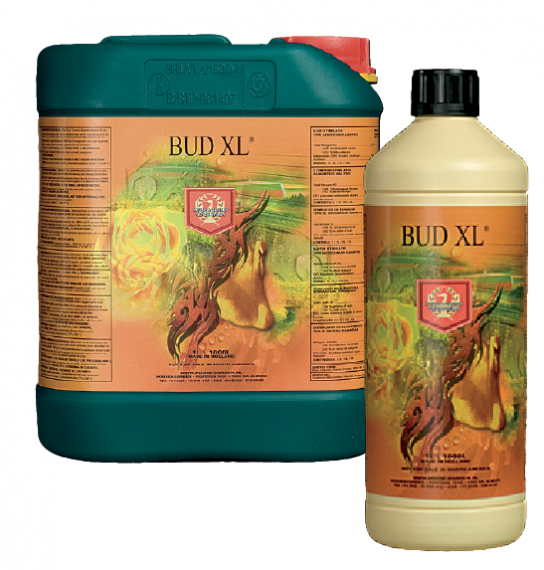 Bud XL’s enzymes extract sugars from the leaves and carry them to the flowers and fruit. This encourages plants to produce terpenes which sweeten aroma and flavour naturally. The sugars also provide energy which speeds up flower and fruit growth. The added amino acids, vitamins, proteins, minerals and Biotin b12 increase the health, size and robustness of flowers. So the yield is not only bigger and sweeter but also of a better overall quality. Works perfectly alongside Shooting Powder. Suitable for soil, coco and hydroponics. Use: Add to nutrient solution from when flowers appear (week 6 of the rearing cycle) through to the beginning of the flush. Dilution: 10ml Bud-XL to 1 litre of nutrient solution. Doesn’t affect EC levels.